At 83 years old Emmanuel Kouang is the oldest person in Ebome. Sitting in a dusty armchair in his wooden house next to the dirt road he recalls how, as a teenage boy, he sat on the beach and watched in disbelief as a dark figure seemed to walk out over the water and sink beneath the waves of the Atlantic. "Mamy Wata" he whispers, "one of the ancestors". Even now, almost 70 years later, he leans forward with his fists clenched and his rhumy eyes wide in remembered excitement. "They lived in the rocks out to sea. But they've gone now". The rocks have vanished too, and with them the villagers' main source of livelihood. The reef, located about 1km off shore, was a rich feeding ground for fish caught by the villagers from dugout canoes. For generations they relied upon its natural abundance of marine life. Serge Kouang, the old man's son, said 80% of the villagers were fishermen. But their way of life was disrupted four years ago by the construction of an oil pipeline. News of the project caused great excitement and expectation in Ebome, as people imagined jobs, a bigger school, a medical centre, tarmac roads, motorised boats. The pipeline came, but the pipe dreams did not. The $3.7 billion project to drill for oil in landlocked Chad and pump it through a 1,100 km-pipeline to the Atlantic coast in Cameroon was the most expensive construction project ever undertaken in Africa and one of the most controversial. The pipeline reaches the coast at Ebome and continues out to sea to a tanker loading terminal 11km offshore. The bank of rocks where the fishermen hauled in their nets was dynamited during its construction, destroying Ebome's main fishing ground. A line of buoys now stops boats from entering the area where the pipeline lies buried under the ocean. "Now we have to buy in fish", Serge Kouang remarked. 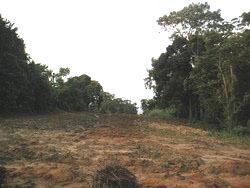 The Cameroon Oil Transportation Company, COTCO, was responsible for building the pipeline, but the project was overseen by the World Bank, which demanded strict environmental and social standards. A programme of compensation for loss of land, hunting and farming grounds and general inconvenience was drawn up and a community liaison team travelled the length of the route to meet those affected. It held more than a 1,000 meetings with villages and individuals and spent over US $8 million on reparations. "The consortium feels it has gone the extra mile to make it work" said Eric Chinje, the African Projects spokesman for the World Bank. COTCO compensated the villagers of Ebome for the loss of their sea fishing by building two ponds for breeding fresh water fish and a refrigerated storage unit to preserve the fish harvested. Two villagers are being trained to maintain and operate the ponds. COTCO says the project was undertaken at the villagers’ request. However, Samuel Nguiffo, a lawyer working for the Environment and Development Centre, a local NGO, said: "It is nonsense that people living beside the sea are being forced to fish in fresh water pools. These fish ponds do not have the same economic value as the sea. They can only harvest fish a few times per year from these pools because the stocks are limited but from the sea you can fish every single day"
For the elders like Emmanuel Kouang, it is not just a matter of money. He laments the spiritual loss. "The ancestors have left us and taken our luck with them," he told IRIN. COTCO says religious issues were dealt with under a 'cultural property treatment plan'. In Ebome, the company paid for a seven-day feast so that the community could communicate with the spirits. It provided two cows and some cash and every family group in the village was represented. Again, COTCO says it provided what the villagers requested . The Chad-Cameroon pipeline in its early stages. [Cameroon] The Chad-Cameroon pipeline..in its early stages. Asked what the village needed, Serge Kouang said the community would settle for a new school, an outboard motor for each of the fourteen families and some long-term jobs at COTCO. Nguiffo accepts that these expectations are too high and that the villagers had a distorted idea of the benefits they might expect from the pipeline, even though meetings were held to seek their compliance for its construction. "The people believed they would get money for nothing, they thought they would get royalties for the next 25 years because they would be living near the pipeline," he said. More than anything, says Nguiffo, the people expected jobs. "There are many unskilled and unemployed people in these small villages - they were told the project would last for 30 years so they were expecting long term jobs". But in reality construction of the pipeline just gave them a few months of manual labour. Chinje agreed that most of the communities along the route "were convinced that poverty was going to be banished." But he refuted Nguiffo's claim that World Bank should have ensured that people had more realistic expectations. "Did we meet all the expectations? Not even if we had another $1 billion could we do that," he told IRIN. "Lots of people were told there would be employment. We offered contracts of, say, six months and people signed. At the end of the contract they were let go and they complained. Was it well explained? Yes. Did the people sign up? Yes. Are they complaining now? Yes. But we couldn't have been more transparent". Chinje said he believed the pipeline would bring development to the villages it passes through the investment of oil revenues "but not overnight". However, there is no guarantee that the government of Cameroon will ever use the money to improve the lives of local people. While COTCO and the World Bank have provided detailed accounts to explain how their US $8 million of compensation money was spent, the government of Cameroon has been less vociferous about explaining where the US $500 million of revenue expected from the pipeline over the next 30 years will end up. "It'll go into the same murky pot which is the Cameroon national budget" warns Ian Gary, author of the Catholic Relief Services' report into oil and development Bottom of the Barrel. He argues that oil can only benefit developing countries if only it is not squandered on the sort of corruption which has marred Angola, Nigeria, and Equatorial Guinea and threatens to take hold in Sao Tome and Principe. The World Bank forced the government of Chad to effectively cede control of its oil money to a Revenue Management Commission. Its nine members, half of whom are drawn from civil society groups, will decide how the money is spent. But they are limited by law to spending the oil money on well defined projects in areas such as health, roads or education. The world is watching Chad to see if the commission can help the government improve on the dismal example set by its oil-rich neighbours. But Cameroon, which is ranked by Transparency International as one of the world's 10 most corrupt nations, has been left to its own devices. "This money is not going to have the same impact in Cameroon as in Chad," Chinje said. Pipeline revenues will make up 50% of Chad's budget while in Cameroon they are less than 1%. "In Cameroon it was more important to use our leverage to ensure the environmental guidelines were met" he added. Nevertheless $15 million per year could significantly improve many of Cameroon's poorest villages if the framework was in place to ensure the money would get there. "The World Bank has missed a trick" says Gavin Hayman from the pressure group Global Witness. "It should have ironed out these issues while it had the leverage". Night is falling in Ebome and the oldest man in the village is staring out to sea at the vast floating storage terminal which is waiting to be filled with Chadian crude. This brightly lit filling platform will dominate the view for the rest of his life. Whether it will change his children's horizons for the better is yet to be seen.